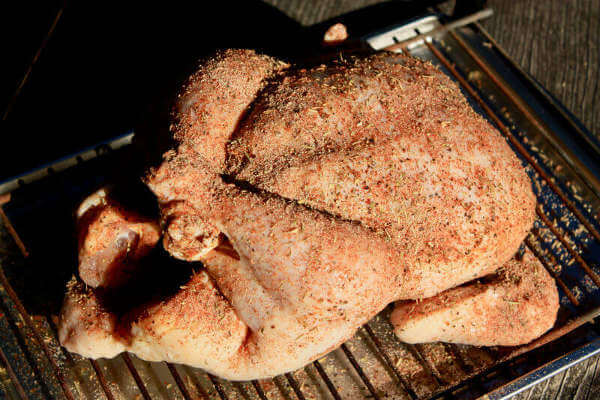 If you like it spicy, you'll love this smoked chicken rub recipe. A blend of several spices along with a bit of good ol' cayenne pepper gives this one an unforgettable kick of flavor. I often prepare chickens spatchcock style for smoking. 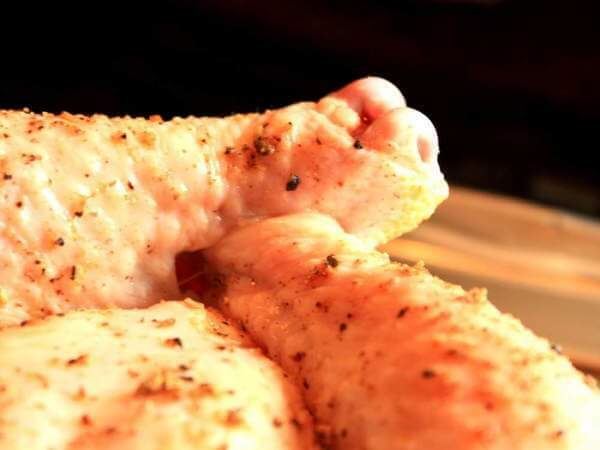 It makes it easy to season all surfaces of the bird for maximum flavor. With a sturdy pair of kitchen shears, cut along each side of the backbone and remove it. 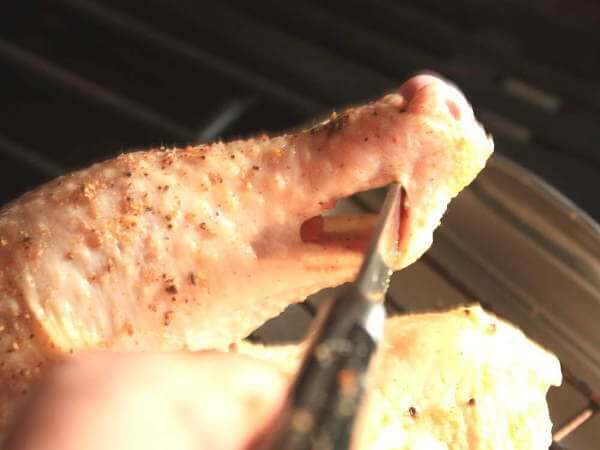 Spread the rib cage open and press the chicken flat. Trim off excess skin and fat. That's all there is to prepping a chicken spatchcock style. 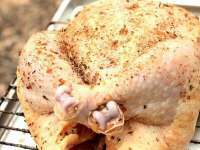 In this form the seasonings and smoke easily reach all sides of the chicken. It also decreases the cooking time a bit to boot. And save the backbone and trimmed away scraps for the stock pot. And Sometimes I Smoke 'em Whole! This whole bird was seasoned generously with my smoked chicken rub recipe, and is now ready to go into my Masterbuilt smoker. Combine all of the ingredients well. 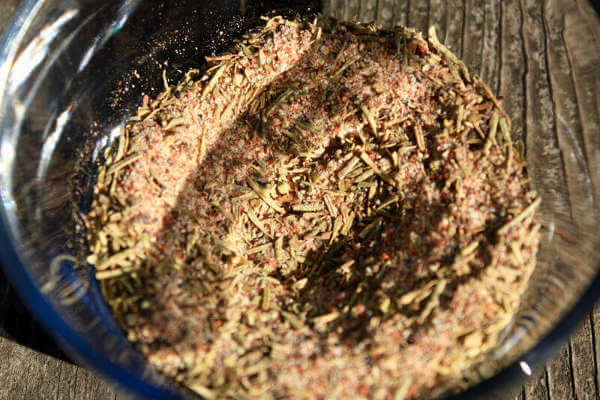 If the herbs are whole, break them up in a mortar and pestle, or rub them vigorously between your hands. Season the chicken on all sides. Let it rest in the fridge for an hour before smoking to give the flavors time to absorb. 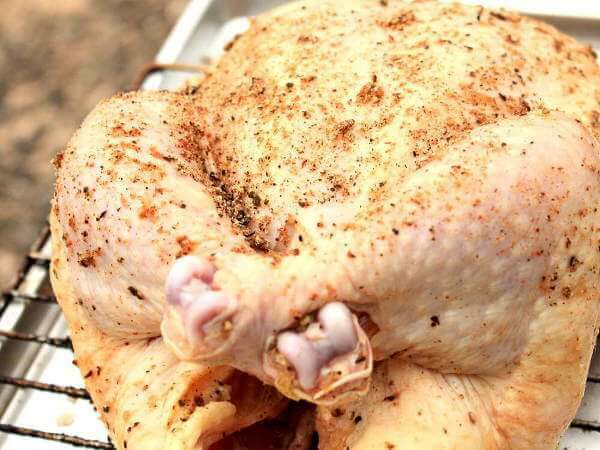 For more flavorful breast meat, put the chicken dry rub under the skin, right against the flesh. 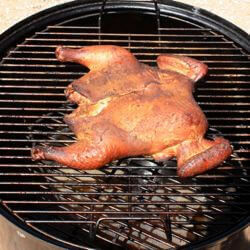 I used a batch of my smoked chicken rub on that plump bird pictured above. After rinsing and trimming the bird it was seasoned with a few tablespoons of the dry rub mixture, taking special care to get it into the nooks and crannies around where the legs attach to the body. About one tablespoon was distributed evenly inside the body cavity. When I have the time, I brine whole chickens before seasoning and smoking. However, I was hungry and in a hurry so I skipped that step this time around. Next I used my stringless trussing technique on the legs - one cut with a knife and a little shoving is all it takes. Select one of the pictures below to view the larger format image. After trussing, the whole chicken went into my Masterbuilt digital electric smoker. Cooking temperature was then set to its maximum of 275˚ Fahrenheit. Three additions of applewood chips and three hours later, the thigh temperature reached 175 degrees. 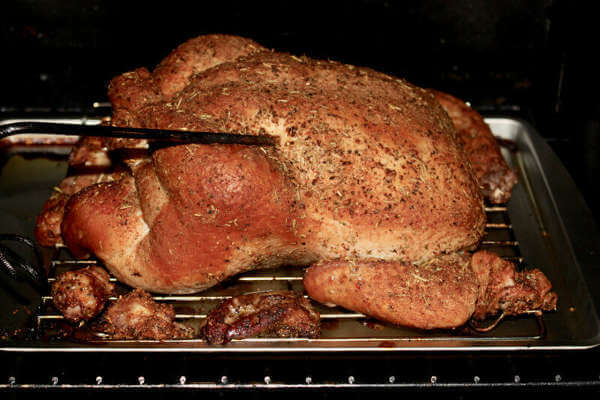 Perfectly done with great flavor imparted by the smoked chicken rub!